My great-aunt “Detty,” or Benita (McGinnis) McCormick, and her younger sister (my grandmother, Alice (McGinnis) Schiavon), lived several blocks apart on the South side of Chicago, both from each other and from their mother, Mary Jane (Gaffney) McGinnis. Their children – my mother, Joan Schiavon, her brother Tom (Thomas Schiavon), and Jane and Buddy McCormick, played together happily most days. Usually, my uncle Tom, ever the bookworm, kept to his inventions and scientific experiments, while my mother, Joan, was a tomboy and usually played outdoors with Buddy and his best friend, Jack O’Brien. Jane, on the other hand, was more ladylike, preferring books and dolls to climbing trees and catching bugs. They also acted in a children’s play, Darby and Joan, at the Medinah Chidren’s Theater in downtown Chicago. This photograph, taken in about 1931, during the height of the Great Depression, must have brought many a smile to Benita, Alice; their husbands Phil McCormick and Ralph Schiavon; and their extended families. Jane and Bud look to be about five or six years old here, while my mother would have been about four. Nothing is cuter than small children, except maybe small children with small animals. One can easily imagine people who desperately needed to make money to feed their own children, bringing their domestic animals up and down residential streets, perhaps borrowing cameras, and offering souvenir snapshots to those who answered the door. 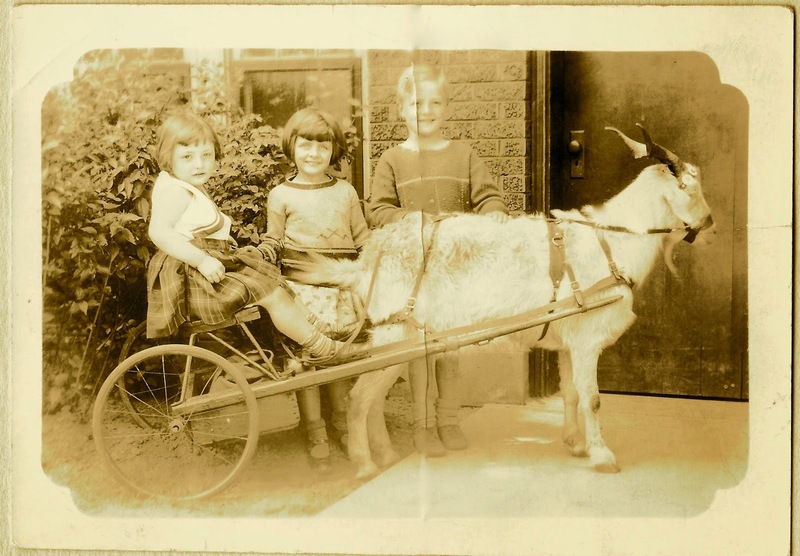 My mother, Joan Schiavon, and her cousins Jane and Bud McCormick, pose on a billy goat and cart. Chicago, Illinois, circa 1931.
next Next post: Motivation Monday: Eight Years of Sharing Stories – and Here’s to Many More!